The Specification 21/26, issued by the Air Ministry's Directorate of Technical. Development (DTD) on September 30, 1926, called for a "Single Seater Fighter Ship--plane for use from HM ships" fitted with a land undercarriage which could be replaced by floats, and vice versa, within half an hour. The aircraft, which was to have an all-metal structure but could be fabric covered, was to be suitable for launch from a catapult and for taking-off from and alighting on the deck of an aircraft carrier. It was to have a good degree of positive stability about all axes in both configurations, and tail incidence had to be adjustable in flight to enable the aircraft to fly horizontally at all speeds without attention from the pilot. It was to be "highly controllable" at all speeds, and especially close to stalling speed, with no tendency to 'hunt' in a steep dive. Control had to be adequate to stop an incipient spin when the machine was stalled. A high degree of manoeuvrability in the air and on the ground or water was desired, and it had to respond quickly to the controls while not being tiring to fly. The ailerons were to have the minimum of yawing effect. As a seaplane, the machine was to have good static stability in the water, and when under tow or running under its own power it was to be stable about all axes at all speeds. Engines specified were the air-cooled Bristol Mercury radial giving 550hp at 2,000rpm or the water-cooled Rolls-Royce Falcon X giving 480hp at 2,300rpm. The installation had to allow for rapid and easy removal of the engine. The cowling, which also had to be easily removable, had to be finished "to prevent the reflection of light which might betray the presence of the aircraft to the enemy or dazzle the pilot". A metal propeller was specified. There was to be tankage for 74 gallons of fuel, plus an easily removed 20 gallon auxiliary tank and a gravity tank of sufficient capacity to allow half an hour's flight at full power at ground level. An 11 gallon oil tank was to be provided if the Mercury engine was used, or an 81/2 gallon oil tank and a 21/2 gallon reserve water tank for the Falcon. Alternative exhaust systems for day or night flying were required, and were to be easily changed. The night-flying system had to provide adequate silencing and flame damping, while the daytime system was to be "of minimum weight". Additional equipment to be carried during the acceptance flights weighed 5581b and included a Vickers 0.5in gun and 300 rounds, a Vickers 0.303in gun and 600 rounds, a rocket launching (R/L) tube and six bombs, and flotation gear. A second 0.303in gun with 600 rounds was to be provided for if the 0.5in gun was not available in time. Minimum performance requirements with this load, using the Mercury, called for a horizontal speed of 132kt (152mph) at 10,000ft and a service ceiling of 23,000ft. With the Falcon X the figures were 127kt (146mph) at 10,000ft and 22,000ft. The length of run to take-off was not to exceed 47ft in a relative wind of 28kt (32mph), and the aircraft was to become airborne at a speed of 55mph when catapulted in still air. The suitability for launching from a catapult or alighting on the deck of an aircraft carrier was "of first importance", and the aircraft had to be capable of taking-off from a turret or cruiser platform. For fighting, the pilot was to have the best possible view in all directions, and a good view forward and downwards was required for carrier landings. A clear, unobstructed view forward over the machine's centreline was needed to enable him to sight the fixed guns, the installation of which was to dispense with blast tubes. There was also to be provision for the fitting of a G.3 aerial camera as near to the sights as practicable, and standard clips were to be fitted to allow the new “light carrier” to be installed to carry four 20 lb bombs, sufficient clearance being provided to enable the bombs to be released in a very steep dive. 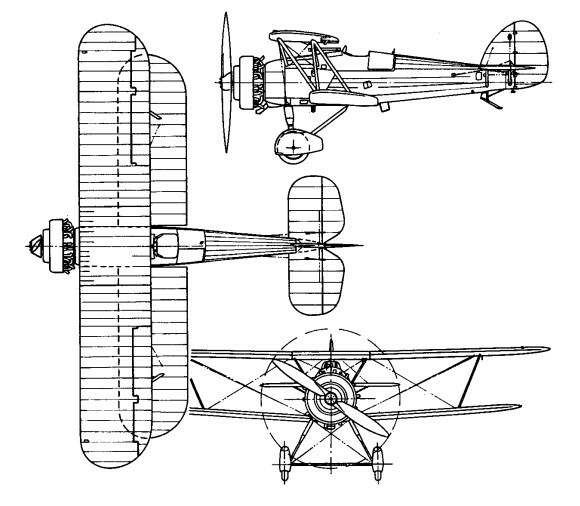 Despite the emphasis placed on the machine's naval use, it was stressed that: "The aircraft is to be designed primarily as a landplane fighter and qualities required for this work are not to be sacrificed in order to improve its characteristics when equipped with the float alighting gear". A padded head support was to be provided to prevent injury to the pilot during catapult launch acceleration. A limit of 35ft was put on the wing span, the overall length was restricted to 23ft, the height was not to exceed 14ft 9in. Quick and easy removal and erection of the wings was specified, with the ability to remove the wing structure completely in ten minutes and replace it in fifteen minutes. The contractor was required to provide a full-size mock-up of his proposed aircraft before constructional work was begun, to enable the Director of Technical Development to examine and approve the layout. This mock-up had to include "all parts and components which are likely to interfere with the all-round view of the pilot", and was to show the internal arrangement of the cockpit. Scale model floats for official water-tank tests were also to be provided, along with specimens of ribs, a section of wing, and a length of spar. The Hoopoe, flown for the first time in 1928, was a two-bay staggered all-metal biplane powered by a 450hp Bristol Mercury II ninecylinder radial. Found to be seriously underpowered when first tested as a float fighter in 1929, the Hoopoe prototype was re-engined with a 520hp Mercury VI. Subsequently returned to the manufacturer after official handling trials at Felixstowe, the Hoopoe was fitted with a new single-bay wing cellule, a 400hp 14-cylinder two-row Armstrong Siddeley Jaguar V engine, and reverted to a wheel undercarriage for a further service assessment at Martlesham Heath. Various structural refinements were introduced and the Hoopoe was once again re-engined, this time with a 560hp Armstrong Siddeley Panther III. 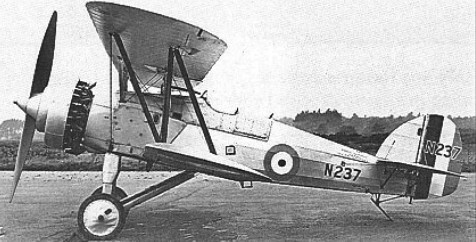 The prototype of the Nimrod fleet fighter had meanwhile commenced flight test, however, and thus interest in the Hoopoe had become no more than academic by mid-1930. None of the aircraft tendered to Specification 21/26 won a production contract.